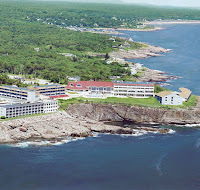 Since 1872, the Cliff House Resort & Spa on the South Coast of Maine has long been the vacation resort for greater Boston, only an hour away. Experience the vastness of seventy acres of oceanfront resort, high above Bald Head Cliff. Every room offers guests their own balcony with an ocean view. Hear the ocean roar, see the sun rise and set against the distant horizon, and... relax. The Cliff House Resort is ideal for spa getaways featuring a full service oceanfront spa as well as fine dining, conferences and corporate meetings.